Welcome to the final Swiss Round of YCS Chicago! Popular Yu-Gi-Oh! 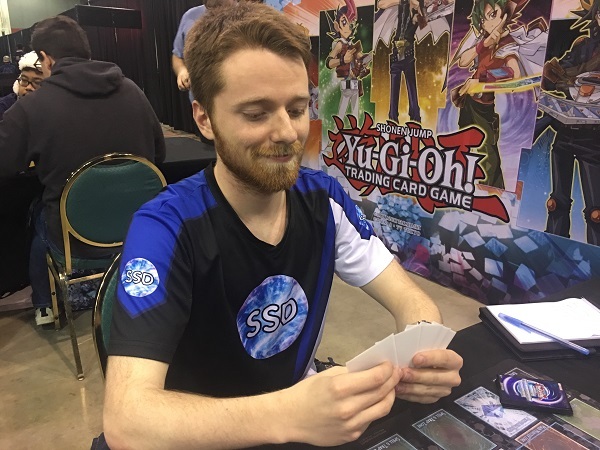 TRADING CARD GAME enthusiast Alexander Cimo from Las Vegas, Nevada is currently 8-2 with his Trickstar Sky Striker Deck, and he’s Dueling against Alex Mondlak from Westerville, Ohio with his Cyber Dragon Deck! Like Cimo, Mondlak currently has an 8-2 record. That means both Duelists will need a victory here in order to make it into the top 32. The stakes have never been higher for these two Duelists. It’s time to Duel! Cimo opened up with Destrudo the Lost Dragon’s Frisson, Trickstar Light Stage, Scapegoat, and 2 copies of Trickstar Reincarnation. He activated Light Stage and used its effect to add Trickstar Candina to his hand. He Summoned it and then activated its effect; but Mondlak revealed PSY-Framegear Gamma from his hand and Special Summoned it along with a PSY-Frame Driver from his Deck to negate the activation of Candina’s effect and destroy Candina. Cimo Set the Scapegoat and both copies of Reincarnation. Then, in the End Phase, Gamma and Driver were banished from the field. Mondlak entered his Battle Phase and Cimo flipped Trickstar Reincarnation. Mondlak Chained Twin Twisters by discarding Machine Duplication, targeting Cimo’s face-down Trickstar Reincarnation and Scapegoat. Cimo Chained Trickstar Reincarnation and then Scapegoat. Cimo Summoned 4 Sheep Tokens to the field. Then, Mondlak banished Jizukiru, the Star Destroying Kaiju, Machine Duplication, and Overload Fusion from his hand to draw 3 new cards. Next, he banished Cyberload Fusion, Cyber Dragon, and Monster Reborn with the second Reincarnation’s effect in order to draw a new 3 cards. In Main Phase 2, Mondlak activated Cyber Emergency to add Cyber Dragon Herz to his hand and then Normal Summoned it. He used it as a Link Material to Summon Linkuriboh and then used Herz’s effect to add Cyber Dragon to his hand. Mondlak activated Cyber Repair Plant next, adding Galaxy Soldier from his Deck to his hand. He sent Cyber Dragon from his hand to his Graveyard to Special Summon Galaxy Soldier to his field and used its effect to add another Galaxy Soldier to his hand. He then sent Ghost Ogre & Snow Rabbit from his hand to his Graveyard to Special Summon another Galaxy Soldier from his hand and combined both Galaxy Soldiers to Xyz Summon Cyber Dragon Nova. 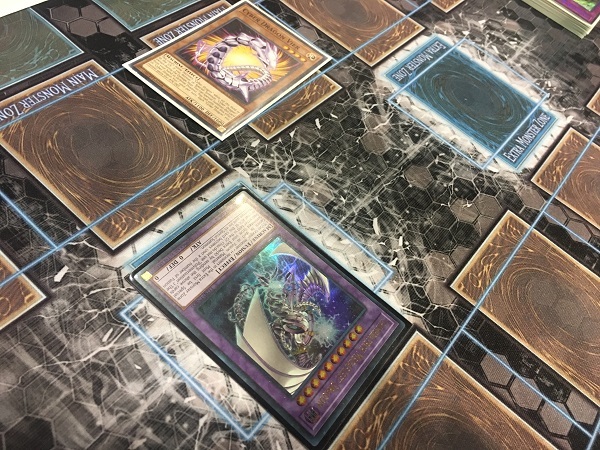 He detached an Xyz Material from it to Special Summon Herz from his Graveyard in Defense Position and then Xyz Summoned Cyber Dragon Infinity over Cyber Dragon Nova. Cimo drew Trickstar Candina for his turn and then used a Sheep Token to Link Summon Link Spider. He used another Token to Link Summon Linkuriboh next, and then combined Linkuriboh with a Token to Link Summon Knightmare Cerberus co-Linked to Link Spider. He discarded Destrudo to try to destroy Infinity, and Mondlak detached Nova from Infinity to use Infinity’s effect and negate the effect of Cerberus. Cerberus wasn’t destroyed, since it was co-Linked to Link Spider. Next, Cimo Normal Summoned Trickstar Candina and used its effect to add Trickstar Lycoris to his hand. He traded in a Token from his field to Special Summon Linkuriboh from his Graveyard and then combined Cerberus with Linkuriboh and Link Spider to Link Summon Borrelsword Dragon! He banished Trickstar Reincarnation from his Graveyard to Special Summon Candina back from his Graveyard next, and then entered his Battle Phase. Candina attacked Linkuriboh, and Mondlak Tributed Linkuriboh to make Candina’s ATK change to 0. Next, Borrelsword attacked Infinity, but Mondlak Tributed Herz to Special Summon Linkuriboh back from his Graveyard. 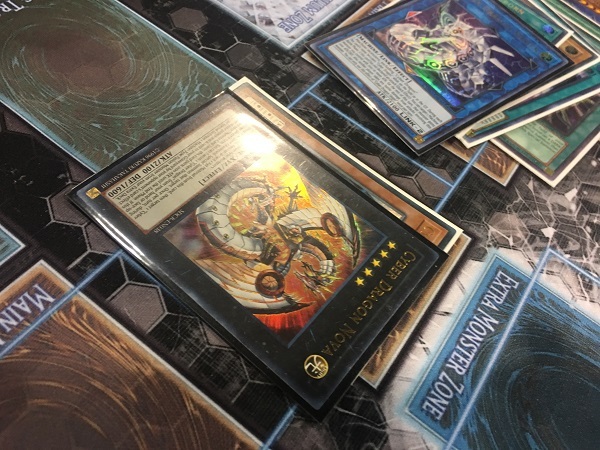 Mondlak added Cyber Dragon from his Deck to his hand with Herz’s effect. Borrelsword attacked Infinity again, but Mondlak Tributed Linkuriboh to change Borrelsword’s ATK to 0, allowing his Infinity to avoid defeat. In Main Phase 2, Cimo paid 4000 Life Points to Special Summon Destrudo from his Graveyard as a Level 3 monster. He Tuned it with Candina to Synchro Summon Yazi, Evil of the Yang Zing and then used Yazi’s effect to destroy Yazi and Infinity. He then Special Summoned Mare Mare from his Deck with Yazi’s effect. He used Mare Mare’s effect thrice to Special Summon 3 Mini Mare Mare Tokens. Next, he used a Token and Mare Mare to Link Summon Knightmare Phoenix. He returned Candina to his hand to Special Summon Lycoris and then ended his turn. Mondlak drew a card and lost 400 Life Points due to the effects of Lycoris and Light Stage. He Special Summoned Cyber Dragon and then Normal Summoned Cyber Dragon Core. He used its effect to add Cyber Revsystem to his hand and lost another 400 Life Points. He activated it to Special Summon Herz from his Graveyard and Herz’s effect transformed it into a Level 5 monster. He combined Herz with Cyber Dragon to Xyz Summon Nova and used Nova’s effect to Special Summon Cyber Dragon from his Graveyard by detaching an Xyz Material. Next, he sent his Core and Cimo’s Borrelsword to the Graveyard to Special Summon Chimeratech Megafleet Dragon. Then he sent Megafleet and Cyber Dragon to the Graveyard to Link Summon Cyber Dragon Sieger. He used Sieger’s effect to increase Nova’s ATK to 4200 in the Battle Phase. Nova attacked Lycoris, and then he used Nova’s effect to banish Sieger and increase Nova’s ATK by another 2100 ATK. With 6300 ATK coming at Lycoris, Cimo’s 4000 Life Points were depleted. Alex Mondlak wins the first Duel with his Cyber Dragons! Cimo opened up Duel 2 with Pot of Desires, Sky Striker Mecha – Widow Anchor, Mind Control, Sky Striker Mobilize – Engage!, and Trickstar Candina. He activated Engage to add Sky Striker Mecha – Hornet Drones to his hand and then activated Hornet Drones to Special Summon a Sky Striker Ace Token. He used the Token to Link Summon Sky Striker Ace – Kagari and used Kagari’s effect to return Hornet Drones to his hand. He Summoned Candina next, and used its effect to add Trickstar Reincarnation to his hand. 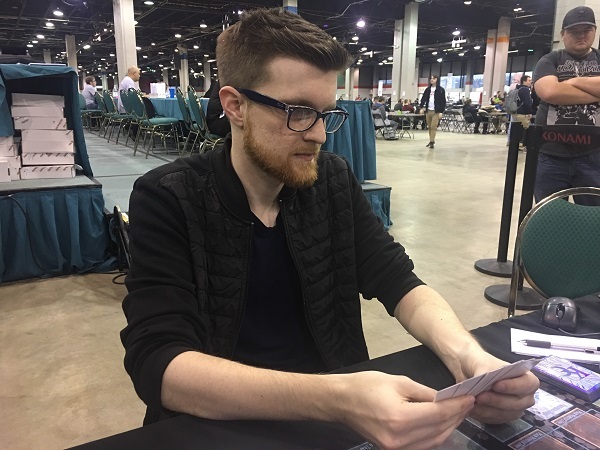 He activated Pot of Desires, banishing the top 10 cards of his Deck face-down; but Mondlak used Ash Blossom & Joyous Spring to negate the effect and stop Cimo from drawing 2 cards! Cimo Set Trickstar Reincarnation and then used Kagari as a Link Material to Summon Sky Striker Ace – Shizuku. He Set Widow Anchor and then entered his End Phase, adding a Widow Anchor to his hand with Shizuku’s effect. Mondlak Set a card to his back row and then Special Summoned Cyber Dragon. He Normal Summoned Cyber Dragon Core next. He activated its effect and Chained the effect of Cyber Dragon Vier to Special Summon Vier from his hand. He added Cyberload Fusion to his hand with Core’s effect. Cimo activated Trickstar Reincarnation, and Mondlak Chained Cyberload Fusion. He shuffled Vier and Core from his field into his Deck to Special Summon Chimeratech Rampage Dragon. Reincarnation resolved to force Mondlak to banish a Galaxy Soldier and draw a new card. Rampage Dragon’s effect destroyed Cimo’s face-down Widow Anchor. Mondlak activated Rampage Dragon’s effect to send Core and Herz from his Deck to his Graveyard and gain additional attacks, and then used Herz’s effect to add Core from his Graveyard to his hand. Mondlak activated Cyber Revsystem next, Special Summoning Herz to his field. He sent Herz and Shizuku to the Graveyard to Summon Chimeratech Megafleet Dragon and then sent Megafleet and Cyber Dragon to the Graveyard to Link Summon Cyber Dragon Sieger. Rampage Dragon attacked Candina, and Mondlak used Sieger’s effect to increase Rampage Dragon’s ATK by 2100. Cimo lost 2400 Life Points. Then, Rampage Dragon attacked directly, dropping Cimo down to 1400 Life Points. When Rampage Dragon tried to score a final direct attack, Cimo banished Trickstar Reincarnation from his Graveyard to Special Summon Candina in Defense Position. Candina was destroyed by Rampage Dragon’s final attack, but Cimo remained in the Duel! Cimo drew Sky Striker Mobilize – Engage!! He activated Hornet Drones to Special Summon a Sky Striker Ace Token to the field and used the Token to Link Summon Kagari. He used Kagari’s effect to return Engage to his hand and then used Engage to add Widow Anchor from his Deck to his hand and draw Droll & Lock Bird. He activated Widow Anchor to take control of Sieger and then used Mind Control to take control of Chimeratech Rampage Dragon! He attacked directly with Kagari and Siger, dropping Mondlak down to 3400 Life Points. In Main Phase 2, Cimo sent his 3 monsters to the Graveyard to Link Summon Borrelsword Dragon. He Set Widow Anchor before ending his turn. Mondlak Normal Summoned Core and activated its effect. He Chained the effect of Vier in his hand to try to Special Summon it. Cimo Chained Widow Anchor to negate Core’s effect and take control of it; but Mondlak was able to send the Borrelsword Dragon and Cyber Dragon Core on Cimo’s field to the Graveyard to Special Summon Chimeratech Megafleet Dragon! A direct attack from Chimeratech Megafleet Dragon wiped out the rest of Cimo’s Life Points! 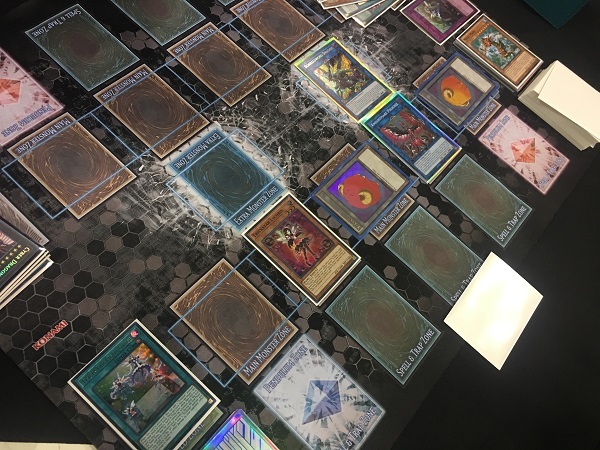 Alex Mondlak uses his Cyber Dragons to defeat Cimo’s Trickstar Sky Striker Deck and knock him out of the tournament! Mondlak ends the Swiss Rounds with a 9-2 record!